Last year we came back to Europe and found a bowling place near our home in Zurich with a great birthday package including 2 hours on a lane with “pillows” in the gutters, a cake and cordial drink. Our son loved it so much we did it again this year. And then we topped it with a party at home with 8 friends from school. 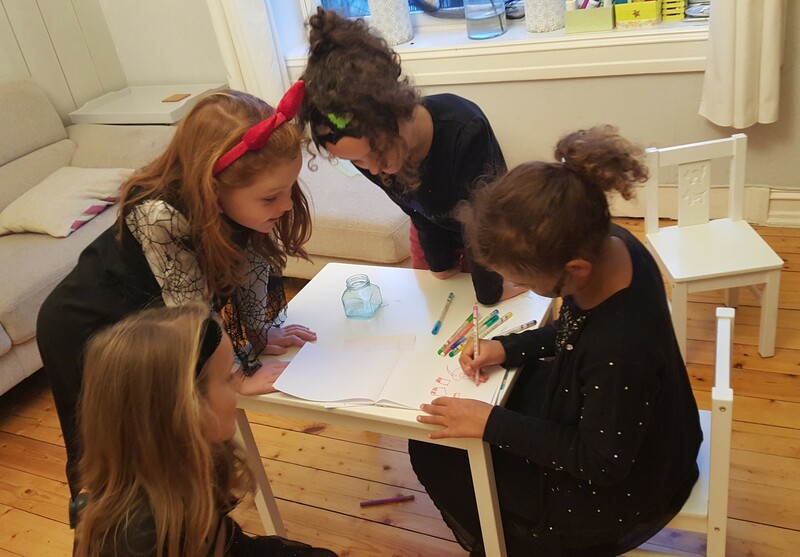 How birthday parties are different in Norway vs Australia or France? Disclaimer: those are kids form the French school in Oslo, but the vast majority of them have at least one Norwegian parent. Right on time: the most impressive thing is that all the guest arrived between 3pm sharp and 3.05pm. By 3.10, all had taken their shoes and jackets off, ready to play! We were not prepared at all. We had planned for an activity where children would arrive one by one over a period of 30 minutes! Dress up is much fun! In the past, we had less time, more budget and younger kids that needed a lot to be entertained. So in Sydney we used to hire an entertainer for a couple of hours, order an amazing cake based on the theme our son would be into at that time (read Thomas the Tank Engine), invite the parents and offer French champagne for drinks and boxes of macarons as party favours. Nowadays, we work less hours, slashed our combined income by 2/3 so we started to get creative. 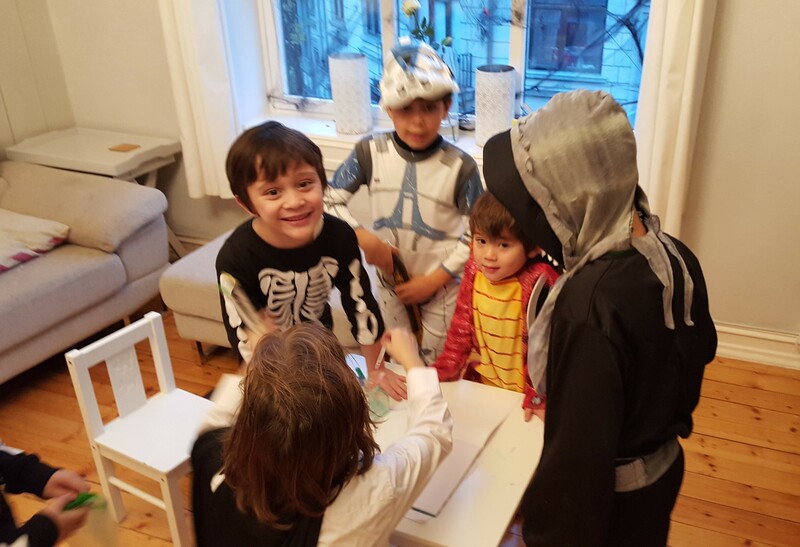 We knew our son wanted a Halloween scary theme. He told us he really enjoyed a scavenger hunt he did at a friend’s birthday a couple of weeks ago so we thought: let’s do it! My husband organised lots of fun, messy activities that take time to prepare and clean up, and I organised what I love the most, educational and no mess activities… yes it’s possible! We divided te 10 kids into 2 groups and we were swapping every 20 minutes. The whole objective was to win tiny beads that would allow you to have turns at the PINATA! Shortbread cookies decoration: hubby pre-baked the cookies and the kids had icing suger images, edible glitters and colouring to decorate the cookies. Even the boys loved it! Put your hand in mysterious things: slime, weird textured plastic plants etc… so much fun! Blind test: guess what you’re eating. We had tomatoes, cheese, yoghurt, chocolate, apple puree, blueberries etc… so funny how some kids have no idea! Pass the parcel: what a success! The local kids had no idea about this game and were totally amazed they could keep the present!!! Musical statues: the kids just love it and it soooooo easy for us, parents! 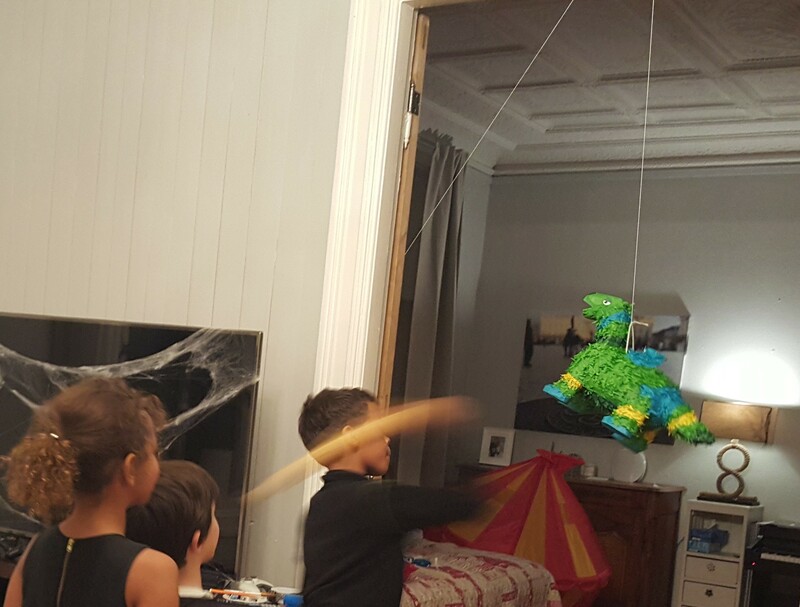 Pinata!!! Just need to be creative to hang it indoors in old 1900 historical buildings! In which country do you eat sushis? er… Norway!!!! Read more about Taco Friday in Norway. I found this ridiculously cheap website where to by party supplies and in particular Halloween decorations: deguisetoi.fr. It was great timing as we spent a bit of time in France the week before my sons’ birthday. I placed he order on Tuesday, it was supposed to be delivered at my mum’s in Paris on the Friday and it arrived one day earlier. Woohoo! 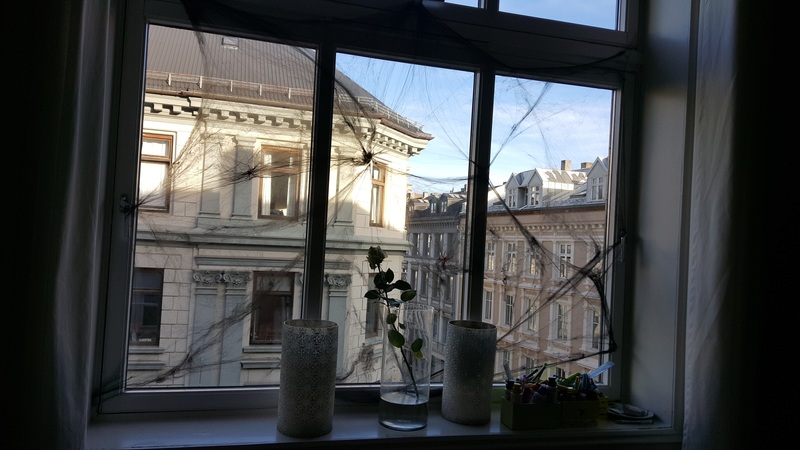 My husband also got some local spiderweb decoration so I spent most of the morning packing stuff away and stretching and placing the spiderwebs around the place. 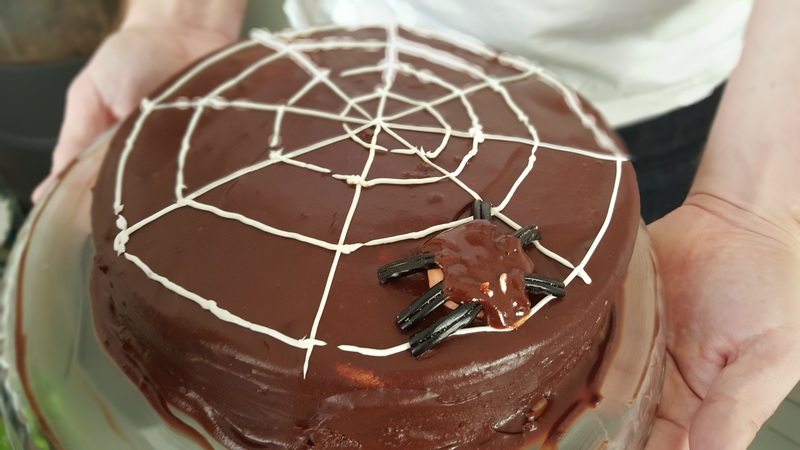 Hubby made the cake from scratch… how cute! Rumours has it you have to invite the whole class in Norway so as to be inclusive, or invite all the boys in the class or all the girls. That’s confirmed here. We were not too sure how strict that rule was but also we knew we couldn’t handle and cater for 23 children. And honestly, there are some kids that our son is not that close too or doesn’t even get along with. It’s the reality of life. You can’t get along with anyone and you have more fun with the people you care about and enjoy being around right? Last but not the least of the surprises! When we did the cake and candle thing, all happily sang Happy Birthday in French, they we prompted the English version which was familiar to all of the kids, except for the “hip hip hourra” part at the end. 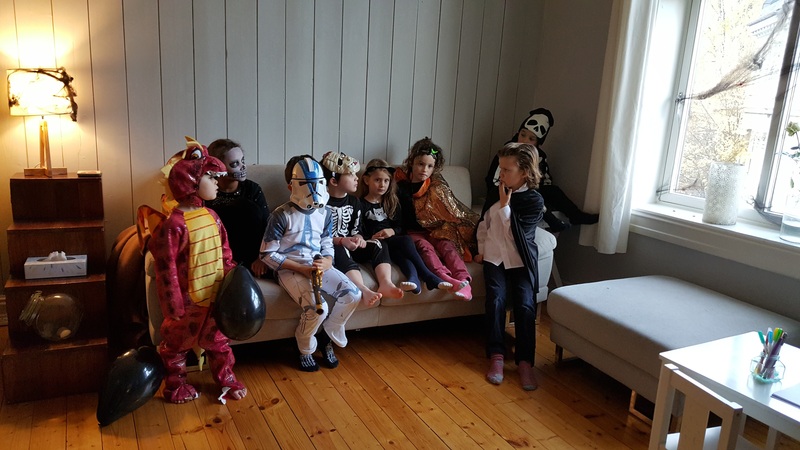 Then I threw in “how about Norwegian” and 4 or 5 kids started singing it… it had nothing to do with the well known tuned that is used in English, French, German or even Chinese and Vietnamese!!! Kids in Oslo: Sognsvann Lake October in Oslo, Norway Must do in Oslo: a trip to Ikea! We’re moving to Norway! Previous article We’re in the Wall Street Journal! Next article November in Oslo: how cold is it and what to wear?